With great pleasure and genuine appreciation, we are announcing our first community contribution to the Power BI management cmdlets. Kudos go to Kenichiro Nakamura, who joined the effort in early July and had already created several cmdlets to work with dataset, table, and column objects, such as Add-PowerBIDataset, New-PowerBIDataset, New-PowerBITable, Get-PowerBITable, Set-PowerBITable, and New-PowerBIColumn. These cmdlets are primarily for push datasets, at least for now, but there’s already community feedback asking for support of all dataset types. It is great to see the demand. For details on parameters and sample scripts, see the Power BI PowerShell documentation under the Data module at https://docs.microsoft.com/en-us/powershell/module/microsoftpowerbimgmt.data/?view=powerbi-ps. The above screenshot shows Kenichiro’s cmdlets in action. This example creates a push dataset with two tables and a variety of columns and places it in a specified app workspace. 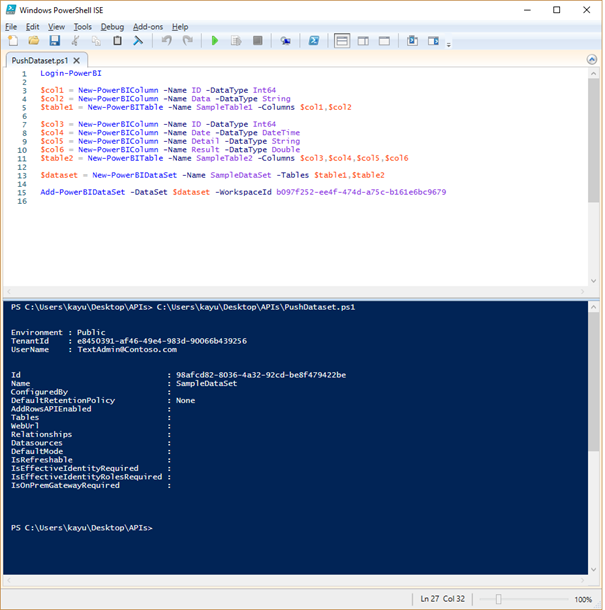 And when Kenichiro finishes his Add-PowerBIRows and Remove-PowerBIRows cmdlets, you will also be able to push data into this dataset directly from PowerShell—and the dashboards will update in real-time. To learn more about real-time solutions in Power BI, see the article Real-time streaming in Power BI in the product documentation. With his contribution, Kenichiro demonstrates very noticeably what can be achieved when we join forces and merge what already exists to deliver the richest possible collection of cmdlets consolidated in a single repository. He originally created a Microsoft.PowerBI.PowerShell module, which you can still find in the PowerShell Gallery. But now that his cmdlets are part of the Power BI management module, a separate installation is no longer needed. Of course, the cmdlets are also available in Azure Cloud Shell (see the article Power BI Management cmdlets in Azure Cloud Shell), and they are supported like all Power BI management cmdlets. Coincidently, Kenichiro visited Redmond recently in his role as a mentor for the TOMODACHI Microsoft iLEAP Social Innovation and Leadership Program, so we took the opportunity to meet and exchange ideas. Here we are at the Microsoft Commons celebrating his contribution. 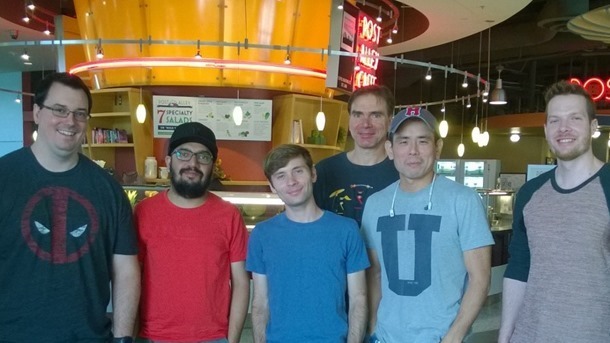 From left to right: Chaz, Harjinder, David, me, Kenichiro, and Mike. So, congrats, Kenichiro! Already can’t wait to get the Add-PowerBIRows and Remove-PowerBIRows cmdlets, and then we’d better hurry to give you additional REST APIs to extend the reach of your cmdlets across all dataset types. Please keep it coming for the benefit of all our customers and the Power BI community.